Mr and Mrs Putman of Park Street, Ampthill have received news that on April 15 their son Richard was seriously injured by a shell burst. Surgeons amputated the shattered leg but on April 26 Richard succumbed at the No.7 General Hospital in St. Omer, France, and is buried close by. 23505 Private Richard Putman had served at the Front for nigh on a year. There is also news of 27359 Private Percy Robinson (19) of Woburn Street, Ampthill who did his early training at the Ampthill Camp. Percy sustained serious head injuries whilst in the trenches with the Northamptonshire Regiment – he did not regain consciousness. Percy is remembered at St. Andrew’s Parish Church in Ampthill. During May the Ampthill Park recruits have seen more action near Arras. Twenty-five of the boys have fallen or died of wounds. One lad –19845 Private Edward H. Wiles of Ravensden – was awarded the Military Medal for his brave actions at Gavrelle on April 22/23, and has since died of his wounds. 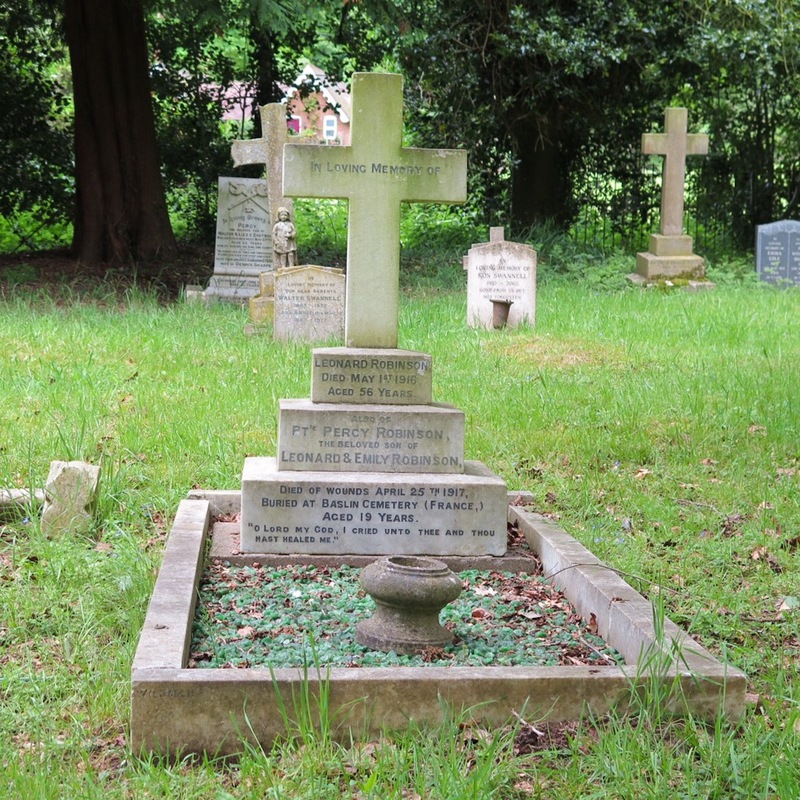 Two boys – 18858 Private Thomas Andrews and 23749 Private Birty Johnson – died at home of their war wounds and are buried in Blighty. Next installment to be published on 30 June 2017…. This entry was posted in Bedfordshire Training Depot, Camp Diary, Uncategorized and tagged Albert Lowe, Ampthill, Ampthill Camp, Ampthill Great Park, Ampthill Park, Arthur Barrett, Arthur Housden, bedfordshire, Bedfordshire Regiment, Birty Johnson, Camp Diary, Charles Armer, Claude Calver, Edward Wiles, George Hayden, George Matthews, George Money, Great War, James Bartram, John Baker, John Brewer, John Ryde, Leslie Reeve, Military Medal, Percy Maslen, Percy Pestell, Percy Robinson, Ralph Higby, Richard Putman, Sidney Church, Thomas Andrews, Walter Riseboro, Walter Skinner, William Draper, William Scotney, William Tompkins, WWI on May 21, 2017 by Ste H.
Mr and Mrs William have received tragic confirmation that one of their sons has been killed. In the Somme region on August 9, last 26703 Private Thomas J. Money was reported as missing in action. After a quiet Spring the Bedfords’ have seen action in the allied offensive at Arras in France. Eighty-four Ampthill Recruits have been killed – 35 of the boys fell in the April 23rd attack at La Coulotte. One of these chaps – 26708 Private William J. SMITH of Dunstable – was awarded the Military Medal for his galant actions. Lieutenant Geoffrey de Cateret Millais survived the action and has been recommended to receive the Military Cross for “cool courage at LA COULOTTE on the 23rd inst. Though lying out in a shell hole all day a short distance from German wire when he was continually fired at with M.G. and Minnenwerfen which became intense and his retiring a problem, he despatched [?] later despite the fact that he knew this would draw attention to his position. One of the men with him was wounded. He also sent back two messages by power buzzer and was unable to withdraw until night” – war diary. On April 29 ten Ampthill recruits were killed in action with the 4th Bedfords’ at the Battle of Oppywood. The Battalion attacked at dawn & captured its objective, was counter attacked and driven out and recaptured trench and consolidated it about 11.0 A.M. The trench was shelled heavily by German artillery all day – war diary. Fifty-nine of these 83 Ampthill recruits have no known grave. Next installment to be published on 31 May 2017…. This entry was posted in Ampthill Command Depot, Camp Diary, Uncategorized and tagged 10495, 12145, 17667, 17697, 17940, 18116, 18122, 18439, 18591, 18611, 18626, 18641, 18798, 18891, 18904, 18939, 20099, 201447, 20175, 20276, 203213, 20343, 20356, 20425, 20478, 20582, 20706, 22011, 22019, 22675, 22754, 22802, 22836, 22837, 22851, 22956, 22970, 23044, 23067, 23068, 23078, 23086, 23208, 23211, 23217, 23219, 23247, 23263, 23269, 23283, 23285, 23304, 23327, 23357, 23360, 23414, 23415, 23437, 23473, 23477, 23503, 23539, 23623, 23725, 23773, 25124, 25135, 25889, 26133, 26704, 26708, 26768, 27352, 27502, 27645, 27968, 29512, 30819, 31508, 33511, ACD, Albert Miller, Alfred Brunt, Alfred Carrington, Alfred Copperwheat, Alfred Keep, Alfred Medlock, Alfred Tibbles, Alfred Walduck, Ampthill, Ampthill Camp, Ampthill Command Depot, April 1917, Archibald Burr, Archibald Lewin, Archie Drage, Arras, Arthur Eames, Arthur Gray, Arthur Saunders, Arthur Wooding, Arthur Worboys, bedfordshire, Bedfordshire Regiment, Bedfordshire Standard, Bedfordshire Training Depot, Camp Diary, Casualties, Charles Mardle, Corbet Smith, Cyril Cook, Died of wounds, Duke of Bedford, Edmund Blunden, Ernest Currington, Ernest Foster, Ernest Smith, Fallen, Francis Tarrier, Frank White, Frederick Allen, Frederick Bird, Frederick Gadsby, Frederick Layton, Frederick Manning, Frederick Marlow, Frederick Parkins, Frederick Reynolds, Frederick Sanders, Frederick Turner, George Dilley, George Drage, George Money, George Peters, Great War, Harry Fountain, Herbert Ashton, Herbert Cambers, Herbert Huckle, Herbert Rich, Herbert Stuart, History, Horace Weedon, Hubert Islip, Jack Gauge, John Crook, John Edwards, John Piggot, John Searle, Joseph Handscombe, Joseph Simcoe, Killed in Action, La Coulotte, Lewis Lambert, Military Medal, Oliver Harpin, Oliver Rawlings, Ralph Marshall, Reginal Secker, Reginal Smith, Reuben Gray, Richard Putman, Robert Sterry, Sidney Read, Sidney Roberts, Stanley Few, Thomas Durham, Thomas Fletcher, Thomas Gore, Thomas Minards, Thomas Redding, Thomas Stocker, Tomas Janes, Wilfred Sturgess, William Abbott, William Dean, William Lawrence, William Neal, William Peddar, William Smith, William Webster, WWI on May 3, 2017 by Ste H.
The Bedfordshire Training Depot used two firing ranges. In Ampthill Park there was a 30 yard miniature range where the recruits practiced with reduced calibre .22 Lee-Enfield Rifles. The musketry instructor was Second-Lieutenant HL. Farnell. 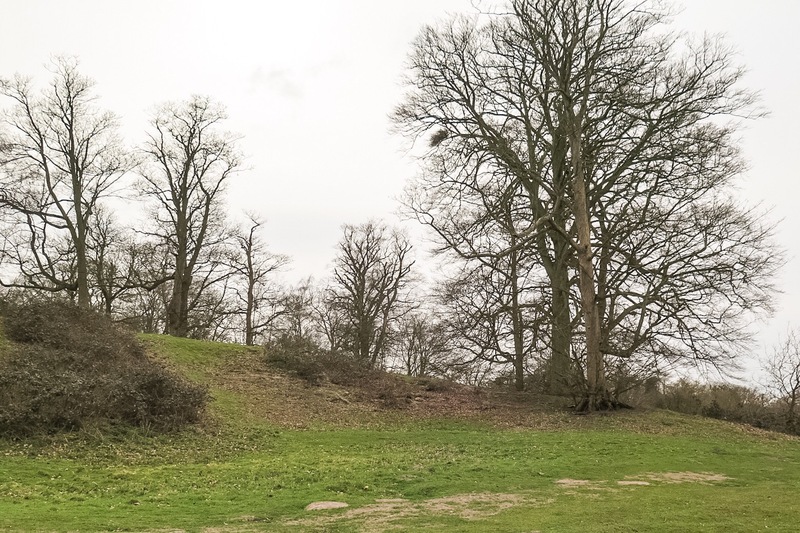 The main firing range was at Millbrook and dates from the 1870s. It is likely the range was upgraded to meet the 1908 British Army standard. In the aerial photograph the butts are clearly visible (centre left). Recruits went on to use this range once they mastered the basics of weaponry. Millbrook Proving Ground now occupies the land. The Bedfordshire Standard. The Bedfordshire Times & Independent. These original broadsheets are part of the Bedfordshire & Luton Archive. This entry was posted in Bedfordshire Training Depot, Uncategorized and tagged Ampthill, Ampthill Park, bedfordshire, Bedfordshire Regiment, Bedfordshire Standard, Bedfordshire Times, Bedfordshire Training Depot, Central Bedfordshire Council, Great War, Lee Enfield, Lieutenant Farnell, Millbrook, Millbrook Proving Ground, WWI on March 31, 2016 by Ste H.
May 1915 – The recruits have been issued with blank cartridges and have carried out two night attacks, one upon the hill at Lidlington and another in woods near Ampthill. Attack and defensive orders are a daily routine. General Currie has visited the Camp to make a general inspection. Messrs. Blake Bros have visited the Camp for the purpose of filming a picture* to be shown in the local cinemas. The film is sanctioned by the War Office and produced under the direction of Lietenant Colonel Vernon Mellor – it shows the man enlisting up to the time that he has been passed as a fully trained man in the Bedfordshires. * The film was one of a series that the War Office commissioned as part of the ‘War Office Official Topical Budget.’ The silent newsreels were catalogued. The Bedfordshire Regiment picture is not among the surviving reels. The Bedfordshire Times and Independent. These original broadsheets are part of the Bedfordshire & Luton Archive. Next installment to be published on 1 February 2016…. This entry was posted in Camp Diary, Uncategorized and tagged Ampthill, Ampthill Park, bedfordshire, blake, Camp Diary, Film, Great War, Picture, training depot, Vernon Mellor, WWI on January 15, 2016 by Ste H.